SHAKÓYE:WA:THAˀ (Sagoyewatha, Otetiani, Red Jacket), Seneca chief and orator; b. c. 1750 in what is now New York State; d. 20 Jan. 1830 on the Buffalo Creek Reservation (Buffalo), N.Y. Although it has usually been translated as “he keeps them awake,” the name Shakóye:wa:thaˀ means “he makes them look for it in vain” according to Wallace L. Chafe’s translation of modern Seneca. As a young man of ability, Red Jacket (then known as Otetiani) attracted the attention of British officers during the American revolution. They employed him as a messenger and gave him the scarlet coat that provided him with his English name. He .was with the Indian-loyalist forces at the battles of Oriskany, Wyoming, and Newtown, and at the raid on the Schoharie region [see Kaieñˀkwaahtoñ*; Thayendanegea*]. Despite the standing he enjoyed among the British military, presumably because of his intellect, Red Jacket earned a less than distinguished reputation as a warrior. He fled from the field at Oriskany. While on the Cherry Valley campaign he complained of the lateness of the season and returned home without seeing action. Another time he exhibited a bloody axe, only to have it revealed he had killed a cow, not a rebel. In later years Red Jacket found himself taunted by Joseph Brant [Thayendanegea] and others for his lack of courage. Following the war, Red Jacket rapidly rose to prominence as a speaker in the numerous councils that established peace between the Senecas and the new United States. At this time the Senecas residing in New York and the Iroquois then at the Grand River (Ont.) became enmeshed in the power play involving Britain, the United States, and the native peoples of the Ohio valley and upper Great Lakes over control of the region west and north of the Ohio River [see Thayendanegea]. Neither the Senecas nor the Grand River Iroquois wished to join the western Indians as allies although both groups were sympathetic to their claims. An increasingly pro-American stand on the part of the Senecas soured their relationship with the Grand River people, and it is reported that Red Jacket even advocated that the Senecas go to war against the Mohawks of the Grand when a lacrosse game between the two groups ended in violence in 1794. The enmity that had developed between the ambitious Red Jacket and the influential Brant during the 1790s had further consequences a decade later. Brant became involved in a dispute with the Upper Canadian Indian Department under William Claus and the government of the colony over the nature of the title to the Six Nations’ lands on the Grand River. With Red Jacket’s support, Claus and the anti-Brant faction of the Grand River Iroquois convened a council of Iroquois from both sides of the border at Niagara (Niagara-on-the-Lake) in 1805. Here war chief Brant and his allies were removed from office. Brant successfully challenged the legitimacy of this move and retained his position for the remaining two years of his life. Deposing chiefs was a typical move in the factional politics that dominated Iroquois reserves in the early 19th century. In 1827 the Seneca Christian faction deposed Red Jacket himself from the position of chief he had held for three decades. Like Brant, Red Jacket reasserted his right to office. When the War of 1812 broke out, each side looked to the Iroquois communities within its borders as a source of manpower. The great Seneca prophet Skanyadariyoh (Handsome Lake) preached neutrality, but others felt differently. The oratory of Red Jacket helped sway the New York Iroquois to the American cause. A council declared war on Upper and Lower Canada. In the summer of 1813 Red Jacket, past his 60th year, took the field as a principal chief. 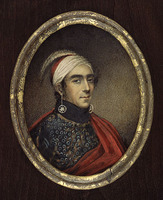 The Senecas joined the American invasion of Upper Canada that year, and he was in an engagement on 17 Aug. 1813 at Fort George (Niagara-on-the-Lake), during which the Indians fought with “great bravery and activity.” The Americans crossed the border again the next summer, with 500 Senecas accompanying them. Red Jacket fought at the battle of Chippawa on 5 July 1814, where among the British and Canadian forces were 200 Grand River Iroquois. Iroquois casualties were heavy on both sides at Chippawa. The wisdom of fighting a white man’s war was questioned. 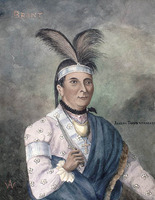 At Red Jacket’s instigation, a delegation of New York Iroquois met their Grand River brethren in mid July to discuss the withdrawal of the Iroquois from the war. Red Jacket returned to Buffalo Creek where he followed a relentlessly conservative course. He resisted the growing white influence among his people. When a Seneca was tried for executing a witch in 1821, Red Jacket took the stand in his defence. In 1824 he even managed to expel white missionaries from the Seneca reservations for a short period. He argued that Christian missionaries could better labour to improve their own race. “Go, then, and teach the whites,” he told one. “Select, for example, the people of Buffalo. We will be spectators, and remain silent. Improve their morals and refine their habits – make them less disposed to cheat Indians. . . . Let us know the tree by the blossoms, and the blossoms by the fruit. When this shall be made clear to our minds we may be more willing to listen to you. But until then we must be allowed to follow the religion of our ancestors.” When his second wife became a Christian he left her, although they were later reconciled. It is reported that his dying request was: “Be sure that my grave be not made by a white man; let them not pursue me there!” He now lies in Forest Lawn cemetery, Buffalo, in a grave dug by whites. Wis., State Hist. Soc. (Madison), Draper mss, ser.S. W. F. Chafe, Handbook of the Seneca language (Albany, N.Y., 1963). T. L. McKenney and James Hall, The Indian tribes of North America, with biographical sketches and anecdotes of the principal chiefs, new ed., ed. F. W. Hodge and D. I. Bushnell (3v., Edinburgh, 1933–34; repr. St Clair Shores, Mich., 1976), 1: 5–32. W. L. Stone, The life and times of Sa-go-ye-wat-ha, or Red Jacket, by the late William L. Stone; with a memoir of the author by his son (Albany, 1866); Life of Joseph Brant – Thayendanegea . . . (2v., New York, 1838; repr. New York, 1969, and St Clair Shores, 1970). H. S. Manley, “Red Jacket’s last campaign, and an extended bibliographical and biographical note,” N. Y. Hist. (Cooperstown, N.Y.), 31 (1950): 149–68. A. C. Parker, “The Senecas in the War of 1812,” N.Y. State Hist. Assoc., Proc. (n.p. ), 15 (1916): 78–90; “The unknown mother of Red Jacket,” N.Y. Hist. 24 (1943): 525–33. G. F. G. Stanley, “The significance of the Six Nations participation in the War of 1812,” OH, 55 (1963): 215–31. Thomas S. Abler, “SHAKÓYE:WA:THAˀ (Sagoyewatha, Otetiani, Red Jacket),” in Dictionary of Canadian Biography, vol. 6, University of Toronto/Université Laval, 2003–, accessed April 24, 2019, http://www.biographi.ca/en/bio/shakoye_wa_tha_6E.html.